In the 1930 U.S. Federal Census, Hollingsworth was the youngest of two sons born to Charles and Cynthia. His brother, Roy, was about four years older. The family lived in Manhattan, New York City at 258 West 153 Street, which was in Harlem. His parents were British West Indies citizens; his father, a shipping clerk at a dress house, emigrated 1917, and his mother, a presser in a dress factory, in 1920. They married around 1923 when she was 19. Bill Schelly's Man of Rock: A Biography of Joe Kubert (2008) has an account of Hollingsworth's teenage years and struggles to get in the comic book field. …Not that Kubert was the only influence on Hollingsworth. The younger boy's work was also shaped by his West Indian and Caribbean heritage and the world of Harlem in the 1930s, which was a center for African-American culture. Hollingsworth's biographer Valliere Richard Auzenne, PhD wrote, "Harlem was a thriving community which pulsated with life, a convergence of sight, sound and color, and a pivot for people of color. A community which supported art created within it confines, jazz, poetry, murals, sculpture, and paintings. This was the world Alvin grew up in." In an interview conducted [by Valliere Richard Auzenne] in the mid-1980s, Alvin Hollingsworth recalled, "My first cartoons were city scenes picturing the Empire State Building, cartoons where superheroes would be leaping from building to building. I got my first job [in comics] while I was in junior high school. I couldn't get paid because I didn't have working papers. My father had to take off from work to go down with me to get working papers so I could get paid. "I would have to get up early in the morning, around six, take the work down to the building and leave it with the elevator driver and come up to my school to be there by 8:00 or 8:30. It forced me to be very disciplined." ...On the weekends, Hollingsworth would visit Kubert at the Kubert home in Brooklyn. [According to his father's, Jacob Kubert, World War II draft card, the home address was 48 East 51st Street.] Kubert said, "We were kids together. We knew each other through high school, I mean, we used to wrestle and stuff like that. Alvin was a good friend." ..."Joe was very nice," Hollingsworth recalled. "Every weekend while the other kids were out playing basketball, I was going over to study with Joe. Joe taught me a lot. He taught me how to cut a line [with] a razor blade…so the line was so sharp it looked like it was printed. He taught me a lot about how to give a picture force by having the punch look like it swept through the page. …Hollingsworth…struggled doing both school assignments and trying to break into the comic-book business. "I remember one term," Hollingsworth recalled, "[when] by midterm I had failed every course but one because I hadn't done any work. I was getting as much artwork as I could do and going to Music and Art full time. Music and Art was a pretty rough school. I was too busy doing cartoons. Mr. Patterson, who know I was doing comic books, spoke to the administration on my behalf. They lightened my load back to four classes and I passed everything by next term. "When I got into the field I began running into prejudice, for now I was competing for jobs," Hollingsworth remembered. "I was no longer 'helping people,' " At first he worked for Bernard Bailey, who had a shop operation, just because of the difficulty of lining up his own work. Eventually he was able to find assignments on his own. Hollingsworth went on to carve out a substantial career in the comics field, jumping around the genres, but proving most effective on the horror strips that became popular at the decade's end. Much of his work was for Fiction House, Avon and Lev Gleason. Another artist that shows up working for Simon and Kirby during this period is Alvin Carl Hollingsworth….Previously he worked for Holyoke Publishing Company working on Catman. Hollingsworth was also a talented fine arts painter. Joe Simon remembers Alvin and has a high opinion of him. Joe remarked that he thought he was the only African-American working in comics at that time. This is not truly accurate since there was also Matt Baker who played an important part in the early history of comics. But Matt Baker never worked for Simon and Kirby and so Joe was not aware of him, or at least of his background. Hollingsworth is another of those artists whose current reputation is much lower then [sic] warranted by his talent. This is largely because he left the comic book field in the late ’50s first for syndications strips and then the fine arts. It is a recurring pattern that I have noticed that comic book artists who did not take part in the superhero revival of the 60′s and later generally do not get much attention today…. According to Who's Who, Hollingsworth continued his art studies at the Art Students League of New York; his instructors were Yasuo Kuniyoshi, Ralph Fabri and Dr. Bernard Myers, from 1950 to 1952. At City University of New York, he earned his Bachelor of Arts in 1956, and Masters of Arts in 1959. The Art Students League of New York: Summer Schools in Woodstock and New York City, 1971 catalogue said, "…After graduating from the High School of Music and Art, he went on to City College of New York City and subsequently switched from social studies to a major in art. He was a Phi Beta Kappa graduate at City where he went on to earn his M.A…." During the 1950s he worked on the comic strip Scorchy Smith, assisted George Shedd on Marlin Keel, and produced Kandy for the Pittsburgh Courier/Smith-Mann Syndicate . Samples of his original art and comic book cover art are at Heritage Auctions. Hollingsworth is mentioned in It's a Man's World: Men's Adventure Magazines, The Postwar Pulps (2003). ...The illustrators who provided the fabulous covers of soldiers with anacondas wrapped around their necks surrounded by nymphos—now seen as classic period art—were a breed apart. Many were serious bodybuilders, actually resembling the action heroes on their covers. Art director Mel Blum, for one, was a huge, deaf weightlifter, though he remained terrified of publisher Martin Goodman. "Did Guh-man like it? Is it all right with Gun-man?" he would often ask Bruce Jay [Friedman]. Mort Kunstler was another top-dollar freelance artist, who could command about a thousand bucks for a detailed painting of a civil war death camp. He was the only one who could take Blum at arm-wrestling, in which they often engaged. James Bama, a first-string artist, was yet another weightlifter, Bruce Jay recalls visiting his studio, where he worked upon a dozen canvasses at once—adding brushstrokes to Mag[azine] Management covers, advertisements, other magazines' covers and back. Finally, there was Al Hollingsworth, possibly the first Black cartoonist in men's adventure, whom Bruce Jay brought in early on. Hollingsworth was an exceedingly jolly fellow who later became a distinguished painter and—needless to—was also a massive weightlifter. 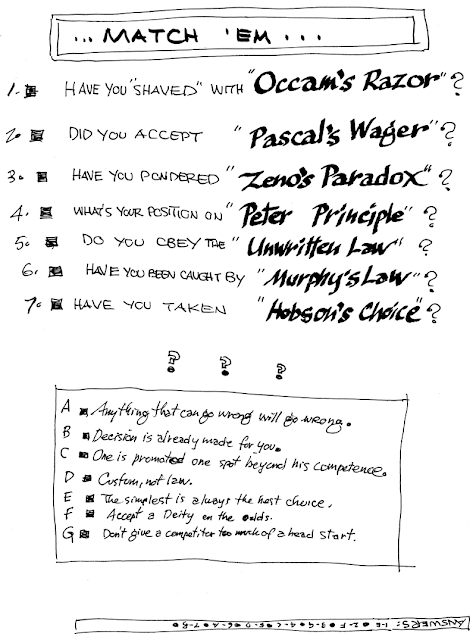 His interior art work has been identified in Man's Daring Adventures #1, November 1955 and #3, July 1956.
Who's Who said Hollingsworth was a graphics instructor at the High School of Art & Design from 1961 to 1971. Jet magazine, May 16, 1963, said, "Harlemite Alvin Hollingsworth, acclaimed by art critics as an 'internationally significant' painter, is one of the busiest artists in New York. In addition to his art work for the publication Manhattan East, he teaches at the Pan American Art School and the High School of Art and Design." Who's Who said he won the 1963 Emily Lowe Art Competition Award, and the 1964 Whitney Foundation Award. His participation in the Civil Rights movement and the art group Spiral were covered in Artwords: Discourse on the 60s and 70s (1992). The Art Students League of New York: Summer Schools...1971 catalogue said, "…His show at the Dintenfass Gallery in 1965 featured the use of fluorescent materials which under ultraviolet light, produced astonishing, even eerie, effects…." In Black New York Artists of the 20th Century (1998), Victor N. Smythe wrote, "…Interested in the effects of ultraviolet light on fluorescent material, he [Hollingsworth] collaborated with electronic music pioneer Edgard Varese in the late 1960s to create a large multi-media work that provided sensory experience for the spectators…." Men of Achievement, Volume 6 (1979) said he married Stephanie Ann Knoepler in 1966; they had four children. At the Harlem Freedom School, Office of Economic Opportunity, he was a consultant on art and the art coordinator, from 1966 to 1967. He was director at the Lincoln Institute of Psycho-Therapy Art Gallery, from 1966 to 1968. That was followed by supervisor of art at Project Turn-On, in New York, from 1968 to 1969. From 1969 to 1975, he was a painting instructor at the Art Students League. His books include Art of Acrylic Painting (1969, co-author); The Sniper (1969, illustrator); Black Out Loud (1970, illustrator); I'd Like the Goo-gen-heim (1970, author and illustrator); and Journey (1970, illustrator). The Herald Statesman, March 25, 1970, said he was a Ph.D. candidate at the School of Education of New York University. The ART Gallery Magazine, April 1970, said, "…Hollingsworth teaches full days at New York's High School of Art and Design, continues to work toward his Ph.D. (fluorescent materials), and steadily adds to a seemingly endless series of paintings, drawings, sculptures, and prints (some 200 at last count), all of which take the Guggenheim Museum as a sort of leitmotif. 'I love that building,' says Hollingsworth, 'and it's a real challenge to see how many creative things I can evolve from that one theme.' " According to an October 24, 1970 listing in the New York Times, "You're Part of Art" debuted October 24 on New York City TV station WNBC. The description said, " 'City Textures and Art', produced in cooperation with the Art Students League of New York. First of ten programs, Alvin C. Hollingsworth is host." The Art Students League of New York: Summer Schools...1971 catalogue said, "…His mural for the Paul Robeson Lounge at Rutgers University was completed in the spring of 1970." He received the 1971 Award of Distinction, from the Smith-Mason Gallery. His painting was included in the Ebony magazine, April 1971, feature, "Artists Portray a Black Christ. Who's Who said he was assistant professor of painting at Eugenio Maria de Hostos Community College, from 1971 to 1977, then associate professor in 1977, and then professor of visual and performing arts. Something About the Author (1985) included a note from Hollingsworth on his recent work: "A mural for Hostos Community College entitled, 'Hostos Odessey'; a commissioned portrait of Rose Morgan presented to her in June, 1981; a commissioned portrait of Lena Horne presented to her in May, 1982 in celebration for fifty years in show business, I am currently a full professor of art at Hostos Community College [New York]." Hollingsworth passed away July 14, 2000, in Hastings on Hudson, New York. An obituary was published July 17 in the Journal News (Hastings on Hudson, New York). His art is in the Chase Manhattan Bank, New York; Brooklyn Museum Permanent Collection; IBM Collection, White Plains, New York; Williams College Art Collection; and the Johnson Publishing Permanent Art Collection, Chicago. His comic book credits are at the Grand Comics Database and Who's Who of American Comic Books 1928–1999. African American Visual Artists Database has an extensive bibliography and list of exhibitions for Hollingsworth. Well, I looked and A. C. Hollingsworth worked by an artist called A. E. Sargent for Thimk and Fooey (who shared other artists as well) as Sarge and Holly. I know it is him because he signed his full name on at least one article in Fooey and was listed among the contributors in Thimk. And I see Holly and Sarge worked on the men's Magazine Relax as well... I may even have an issue somewhere. Had it, found it, scanned it. 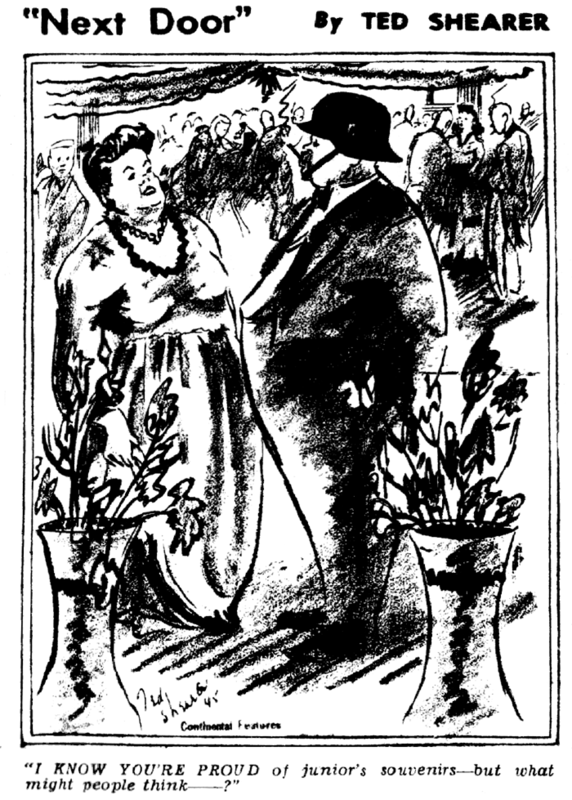 Hollingsworth an Sargent were both art editors at the 1957 magazine and did illustrations apart from each other, so this might be where they met. Just picked up orignal art for a strip called "Dorothy Tutor" signed by A.C. Hollingsworth in the last panel. There are a few pasteovers and plenty of zipatone on the strip so it seems it was published. The art was listed as Dorothy Tutor and after a little digging, I was able to find two other examples of this strip. Has anyone heard of this? In what I have read on Mr. Hollingsworth, there has been no mention of him having taught art at Paul Hoffman Jr. High School, off of Fordham Road, across from Fordham University in the Bronx, NYC. I was assigned to Alvin C. Hollingsworth during my semester of student teaching as an Art Major at the College of New Rochelle in New Rochelle, graduating in 1958. I knew he was keeping late hours at night - painting. However, I never had any idea of his prolific painting in comic / cartoon art. One day in class, he did a quick pen and watercolor sketch of some of the students in the classroom and presented to me as a gift. This magnificent work has hung in my home many years. I have been able to date one Scorchy Smith to April 21, 1954 (we have two originals at the Library of Congress), published in Greeley Daily Tribune April 21, 1954. William Charles Chase was born in Brinkley, Arkansas on July 20, 1910. His birthplace was named at Salute to Pioneering Cartoonists of Color. His birthdate was recorded at the California Death Index and U.S. Veterans Gravesites, both at Ancestry.com. Information on his childhood has not been found. Chase has not been found in the 1920 and 1930 U.S. Federal Censuses. The date of his move to New York City is not known. Artprice.com said he was a "graphic artist", who studied at Howard University, and exhibited in the Harmon Foundation's 1933 show. The Encyclopedia of the Harlem Renaissance, Volume 1 (2004) has an article on the Harmon traveling exhibition. Dark Laughter: The Satiric Art of Oliver W. Harrington (1993) named Chase as an art director and cartoonist at the New York Amsterdam News Magazine. 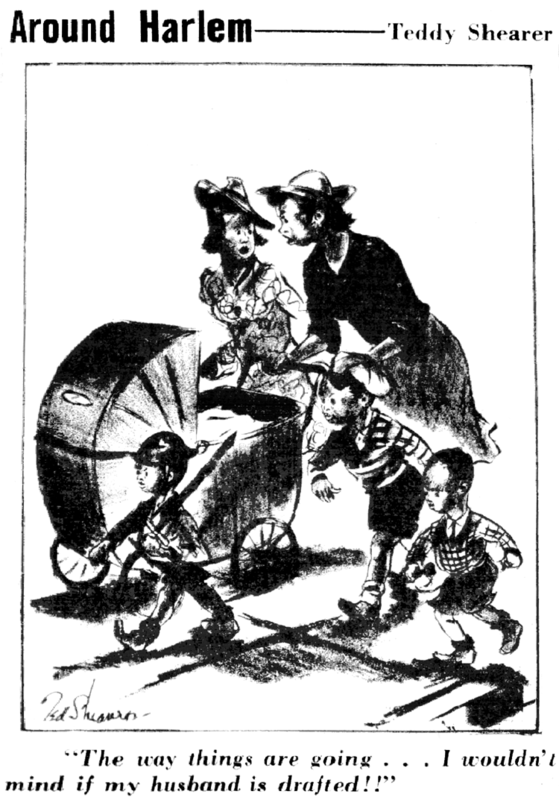 …Among the sixteen contributors listed and pictured in the full-page advertisement were four cartoonists: E. Simms Campbell, prominently featured and the best known at the time; William Charles Chase, the art director; the prolific Jay Jackson; and Ol' Harrington. Beginning in the newly inaugurated tabloid section. 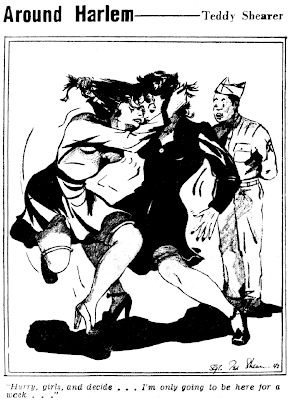 New York Amsterdam News Magazine, on 25 May , Harrington's first Dark Laughter panel appeared, alongside a full-page series of cartoons by Campbell called Harlem Sketches, a small panel by Chase about modern young women appropriately titled Modernettes, and what would prove to be a long-running illustrated serial novel by Jackson about an exotic woman named Tisha Mingo (which opens interestingly in a Chicago bawdy house)…. A sample of his Pee Wee strip is here. A passenger list at Ancestry.com recorded Chase's voyage across the Atlantic Ocean. Aboard the S.S. Paris, he sailed, on August 28, 1936, from Southampton, England. He arrived in New York City, September 4. His date and place of birth was "July/20/1911 Brinkley, Ark." and his address was "208 W. 149th Str — N.Y.C. ", which was in Harlem. Presumably he spent time in Europe. One of his sports cartoons is here and an editorial cartoon is here. According to the U.S. World War II Army Enlistment Records at Ancestry.com, Chase enlisted July 11, 1943. His birth year was "1911". He was single without dependents, and had "4 years of high school". His occupation was categorized under "authors, editors, and reporters". Some time after the war, Chase moved to San Francisco, California, where he passed away on March 1, 1956. The Plaindealer (Kansas) published news of his death March 9, 1956. San Francisco—(ANP)—Bill Chase, 45, editor of the San Francisco Independent, died in his office Thursday morning, apparently of a heart attack. Chase was born in Fort Smith, Arkansas, attended Howard University and Traphagen School of Deign in New York. He was well known as a cartoonist and formerly served as society editor of the Amsterdam News in New York City, where he lived for a time. He became editor of the Independent in January, 1955. On March 8, Chase was buried at the Long Island National Cemetery in Farmingdale, New York, according to U.S. Veterans Gravesites. 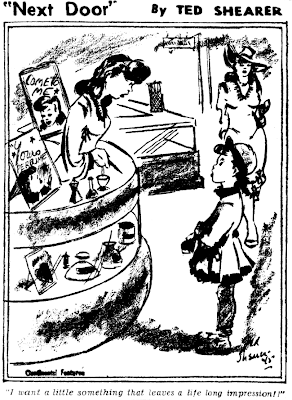 When we left off yesterday, I was saying that the Amsterdam News discontinued Around Harlem in favor of another Ted Shearer panel cartoon series in 1944. That series was Next Door, which actually began life (at least as best I can determine), on August 12 1942 (a date gleaned from the Atlanta World). Next Door and Around Harlem both had the same type of art and gags,and one appeared in papers through Continental Features, while the other appeared in the Amsterdam News. That brings up the question of whether there actually were two features, or if Next Door was simply a renamed Around Harlem. Unfortunately I don't have an answer. I have never pinned down to my satisfaction that Continental Features was definitely the distribution arm of the Amsterdam News, though all evidence points that way. And I have never yet had the luxury of examining two papers that ran the features side by side to see if they match up during the years 1942-44 when they both ran. Feel free to consider that one your homework question folks. Anyhow, Next Door was a very long-running feature in a field dominated by short-timers. 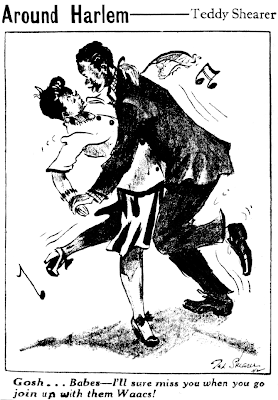 It ran until at least February 22 1953 (date from the Baltimore Afro-American), over a decade, maintaining very high quality art and gags throughout the run. I think near the end Shearer may have self-syndicated the panel, as in the 50s it gains a copyright slug for Paragon Features, a company that has no other credits of which I'm aware. 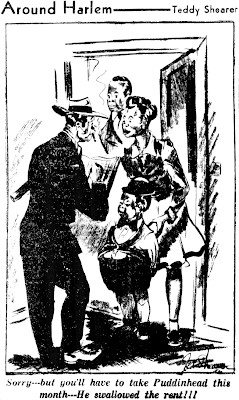 Even though Ted Shearer was a tender 23 years old when Around Harlem debuted on February 14 1942, he was already a veteran hand, having already been contributing art to newspapers for five years by that time. Around Harlem, though, is the feature in which he really seemed to hit his stride as an impressive and self-assured cartoonist, as the above samples more than adequately attest. Around Harlem doesn't seem to have been syndicated, but only used in the New York Amsterdam News. If it was syndicated the name of the feature might well have been altered to make it less NYC-centric, so I may have seen it elsewhere and not recognized it as the same feature. Around Harlem was produced while 'Teddy' Shearer was in the service in the heat of World War II, so it's no surprise that many of the gags were about the war and the military. I don't know what Shearer's role was in the 92nd Division of the Army, but it seemed to afford him adequate time to draw his feature on a regular basis. Considering how spotty the production of other features were in the black papers, Shearer was a paragon of punctuality; rarely did he miss a weekly edition. Thaddeous E. "Ted" Shearer was born in May Pen, Jamaica on November 1, 1919. His full name was obtained at Ancestry.com in the U.S. World War II Army Enlistment Records; USGenWeb Archives has a transcription of the New York County, New York Archives, Military Records which has his full name. His date of birth is from the Social Security Death Index. He and his mother, Sophia were found on a New York passenger list. Aboard the S.S. Turrialba they departed Kingston, Jamaica on October 25, 1921, and landed in New York City on October 27. According to a New York Times obituary, published December 30, 1992, he grew up in Harlem. Almost seven years later, Shearer returned from another trip to Jamaica. On the passenger list, his mother's name was recorded as "Moodie, Sophie R."; she had remarried to "P.D. Moodie" who resided at "2 St. Nichols Place, N.Y." Joining them was his older brother, Raphael D., and step-brother, Hugh B. Moodie. They sailed aboard the S.S. Yoro from Port Antonio, Jamaica on September 21, 1928, and arrived in New York City on September 28. According to the 1930 U.S. Federal Census, Shearer's step-father was Percy, a railroad waiter. The family of five lived in Manhattan at 408 West 150th Street. The Herald Statesman (Yonkers, NY), in its April 8, 1980 issue, said he "began his career at 16 with a two-column panel, 'Around Harlem,' in the Amsterdam News…" From the Piqua Daily Call (Ohio), July 10, 1970, is an excerpt about his education and art training. 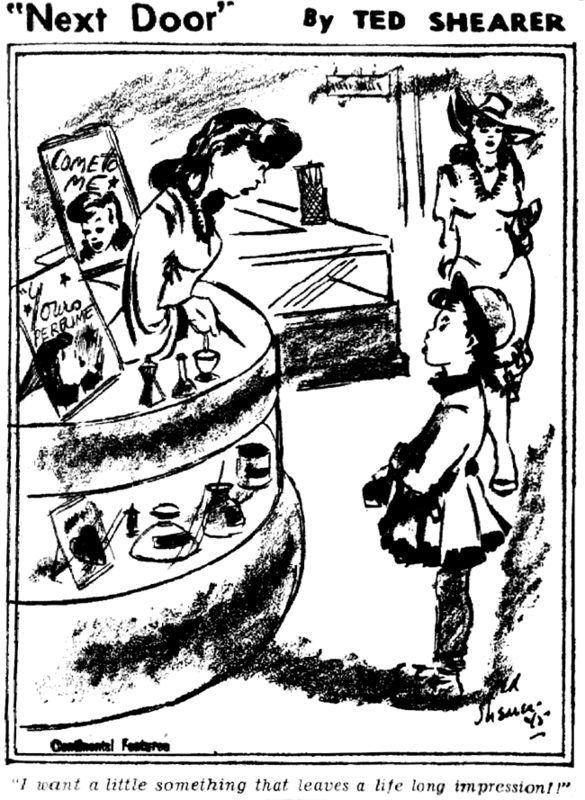 Ted sold his first free-lance cartoon at the age of 16, while still a student at New York's DeWitt Clinton High School. And his teachers regularly bought Ted's etchings. He won five medals and two scholarships at that school and attended both the Art Students League and Pratt Institute on scholarships. The U.S. World War II Army Enlistment Records indicate Shearer enlisted on October 27, 1942 in New York City. He had three years of high school education; a commercial artist; single, with dependents; height, 68 inches, and weight, 148 pounds. The Arkansas State Press published, on January 15, 1943, an article about him in the army. Fort McClellan, Ala.—A prominent newspaper and magazine cartoonist is now a member of the 92nd Infantry Division. He is Pvt. 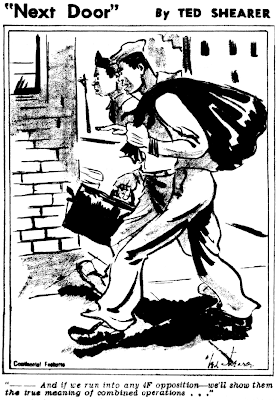 Ted Shearer, whose cartoon has appeared in 35 different newspapers. Now his cartoons will become a weekly feature of the new 92nd Division newspaper. Pvt. Shearer's idea for his cartoons will originate from his life and work with the 92nd. Only 23 years old, he has won two scholarships, many medals, and has had his work displayed at the World's Fair and the New York Public Library. His cartoons also have appeared in "Click," "Swank," and "Collier's" magazines, and two water color paintings were shown at Macy's New York City. One of his features "Next Door" is a weekly feature of this paper. Fort Huachuca, Ariz. (AP)—The 92nd Division's weekly newspaper is an instrument of training and has won the praise of high Army authorities for its effectiveness. 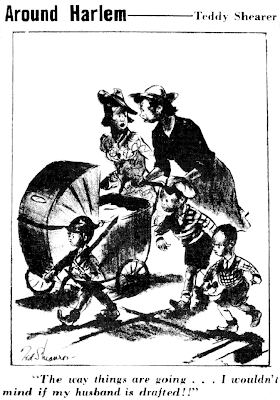 Each week a great deal of space in The Buffalo is devoted to pictures, drawings and cartoons showing the troops in action and illustrating the purpose of that week's training. Sometimes a story accompanies the pictures, but the staff has found art more effective…. …Two magazine and newspaper cartoonists, Sergts. Ray Henry and Ted Shearer, both of New York, contribute…. After the war, the Times said, "He later freelanced, selling drawings to The Ladies' Home Journal, The Saturday Evening Post and other publications. Mr. Shearer was an art director for 15 years at the advertising agency BBDO." The Herald Statesman, in its October 6, 1971 issue, said, "he worked on major accounts as Betty Crocker, Schaefer Beer, and New York Telephone." He also appeared in ads, for Lucky Strike cigarettes, published in newspapers including The Afro American (November 7, 1953) and Baltimore Afro-American (October 8, 1955). Quincy original art courtesy of Heritage Auctions. The Herald Statesman published an interview with Shearer on April 17, 1976 and he explained how Quincy came to be. …Shearer…landed a job as TV art director for the advertising firm of Batten, Barton, Durstine and Osborne. The story of how he left his job, which he held for 15 years, for his present career could be fare for somebody else's fanciful comic strip. As Shearer tells it, the turning point in his career came about when he was commuting from Westchester [New York] to his office in New York City in 1970. "I'm always drawing," he says, "and back then I carried a sketch pad with me on the train. One day, the man sitting next to me said he liked my work. It turned out he worked for King Features and on another day, I showed him one of the free lance strips I had been doing all along for the Amsterdam News. He showed my work to his colleagues at King Features, and that's how 'Quincy' was born…." The Herald Statesman, on October 6, 1971, said, "And who was the artist who 'discovered' Shearer on the Penn Central? It was William Gilmartin of Elmsford [New York]—at the time a King Features staff artist…" The Herald Statesman TV schedule for January 17, 1975 listed the WCBS afternoon program, The People, which was titled, "Quincy and His Man," a filmed interview with Shearer. According to the Times Shearer passed away on December 26, 1992 at Northern Westchester Hospital Center in Mount Kisco, New York. He lived in Pound Ridge, New York. His son, John, said he died of cardiac arrest. The father and son had collaborated on the Billy Jo Jive book series. It formed the basis of an animated feature for the PBS series Sesame Street. He was survived by his wife, Phyllis, daughter, Kathleen Shepherd, and three grandchildren. African Americans in the Visual Arts (2003) profiled Shearer; it can be viewed here. A lengthy profile of Shearer can be viewed at The Cartoonists website. 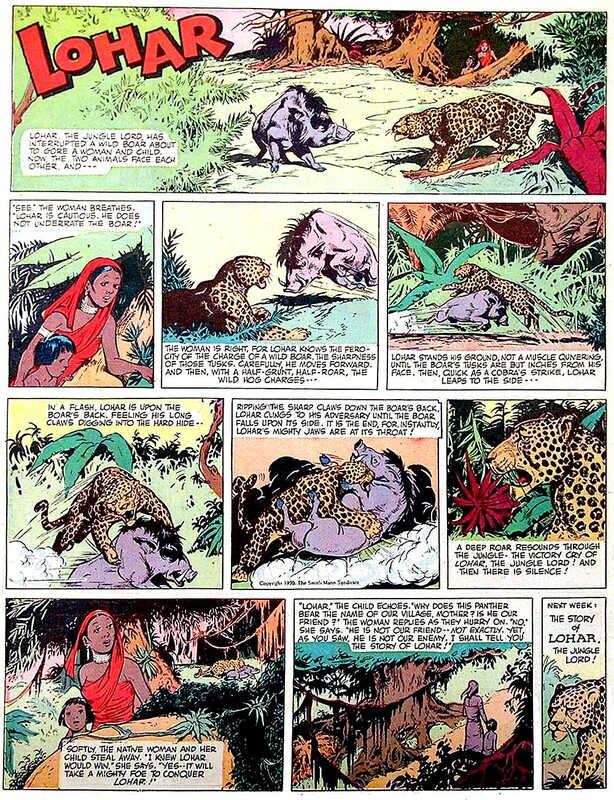 By far the most unusual of the new strips that debuted in the Pittsburgh Courier's color comics section in 1950 was Lohar. 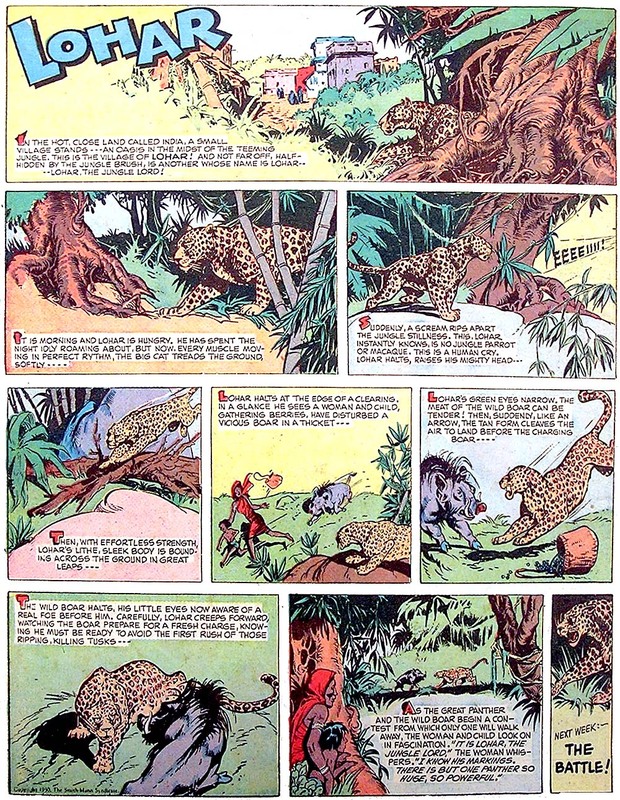 I believe this may be the only dramatic newspaper strip ever to star a wild animal in its natural habitat. Not only was the premise unusual, but the strip was really well-written and drawn. 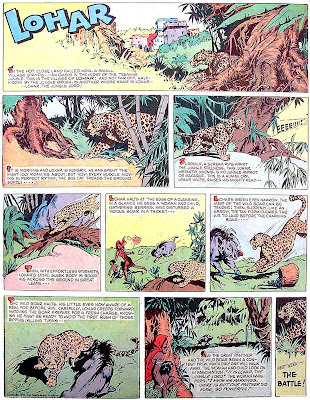 Lohar is the story of a leopard in northern India, and the title of the strip comes from the name of a warrior caste there. 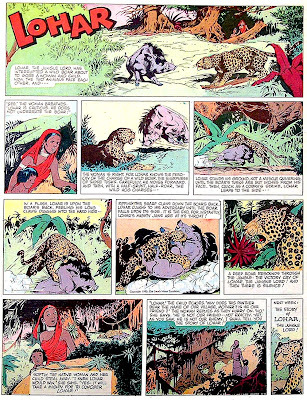 Eventually the strip gets rather strange -- the leopard at one point ends up in the Arctic -- but I have read only isolated episodes so I just can't say if the storytelling was loopy or if the plot developments were organic. Paradoxically, although Lohar was the most intriguing (at least to me) strip in the comics section, it was rarely or perhaps never signed. The credit on the strip I determined through the Editor & Publisher listing, which cited someone named Tom Brady. I know nothing of this person, and wonder if it was one of the other section contributors working under a pseudonym. However, the art style is different enough that I really don't think so. 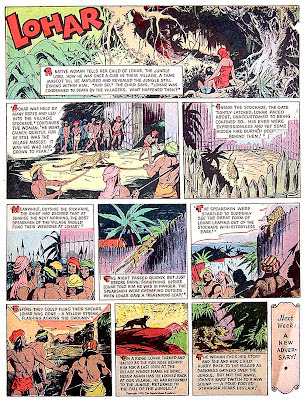 Lohar debuted with the new Courier color section on August 19 1950, and outlived the section, eventually becoming a daily-style strip in the Courier. The strip ended on October 18 1958. Thanks to the University of Michigan Special Collections Library for photos of their collection of Courier color sections. They have the only known run of the early color sections from 1950-51, and were very gracious in sharing photos of the strips in their collection with me. 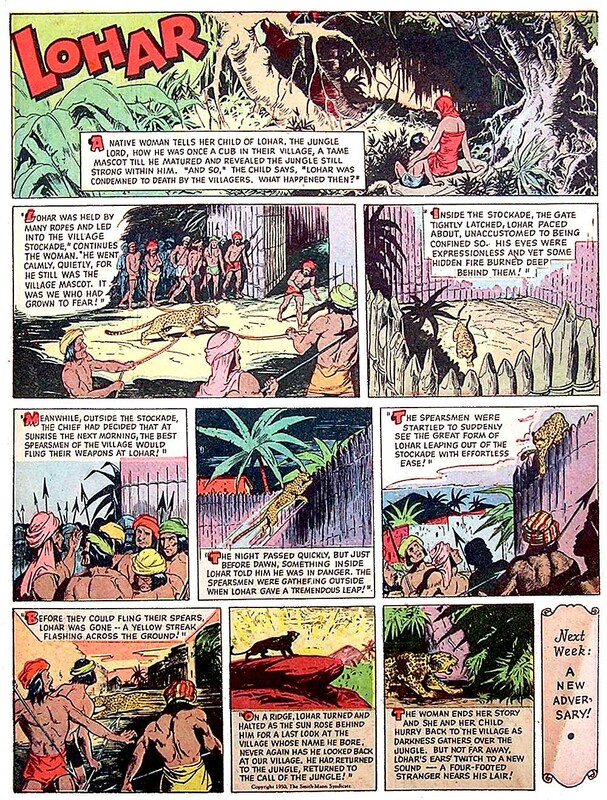 Above are strips 1-3 in the Lohar series. The artist name is Bill Brady. If you want to see more images of Lohar go to this link. Sorry, I see no Lohar images in that post, or any art signed by Brady. How did you determine that the artist on Lohar was named Bill Brady? Do you have any biographical information on this artist? Any idea why the strip was credited to Tom Brady in Editor & Publisher? I new him when I was a child he (Bill Brady ) was a good friend of my father.In a few weeks a comic section will be added to this sit in it you will see many more Lohar. Could you e mail me I have a few questions for you?